A few passing clouds. Low near 65F. Winds SE at 5 to 10 mph..
A few passing clouds. Low near 65F. Winds SE at 5 to 10 mph. From left, Ernesto Pineola, Blanca Villarreal, Paula Villarreal and Americo Villarreal run El Olivo Restaurant, in business since Dec. 3, 1988. El Olivo Restaurant owners Paula and Americo Villarreal pose with Winter Haven Mayor Brad Dantzler Dec. 3. 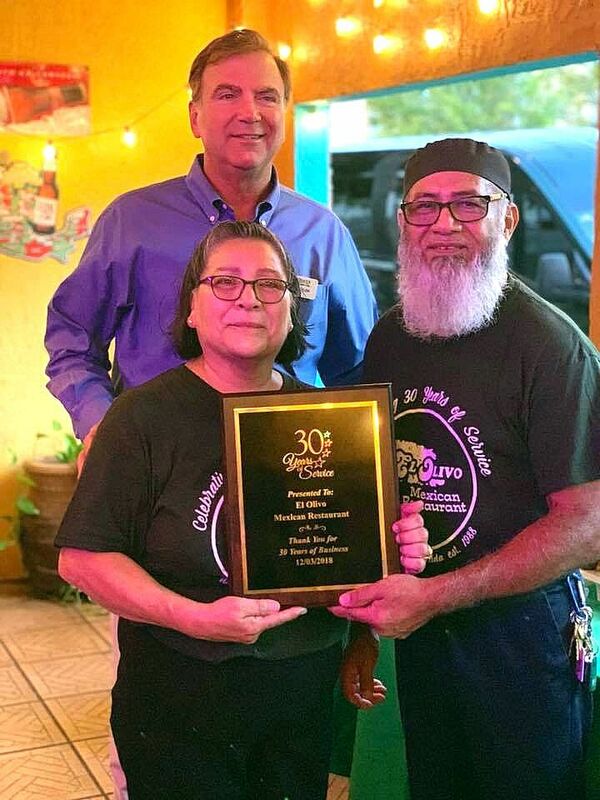 WINTER HAVEN – On Dec. 3 Mayor Brad Dantzler presented El Olivo Mexican Restaurant owners Paula and Americo Villarreal with a plaque recognizing the couple for being Winter Haven business owners for the past 30 years. The family-run restaurant has a long, rich history. Paula’s parents Martin and Maria Delafuente were both born and raised in Mexico and came to the United States as farm workers when Paula was 2-years-old. Paula said her first memory of downtown Winter Haven was shopping at Delgado’s Grocery Store at age 6. Americo was born and raised in Mexico and came to the United States illegally as an adult. Years later, a federal agent offered to help him become a legal citizen, an offer he accepted. Eventually, Americo and Paul met and the two fell in love. Proud of her Mexican heritage, Paula started cooking for Bond Clinic employees who liked to eat on Lake Silver during the 1980s. Nurses would tell her she ought to open a restaurant. Eventually she, her husband, parents and other family members rented space near Mama Dilo’s downtown and did just that. “Everybody in the family put in hours,” Paula said. It took some time, but the restaurant opened for the first time Dec. 3, 1988. El Olivo remained at that original location for around five years. In the years since, it has changed locations four times, mostly moving around in the downtown area but also located for a few years out near what is now Legoland. Paula and Americo’s daughter, Blanca Villarreal, was around 10-years-old when she started helping out at the restaurant’s current location near the Ritz Theatre downtown. At that time it was the only restaurant on Central Avenue. Paula looks back on that decision as a good one now, as over the past 18 years downtown Winter Haven has become a more popular destination. Many who have eaten at the popular restaurant can attest to the consistent quality of the food served. El Olivo proudly boasts that there are no fillers or byproducts in the ingredients. While being interviewed for this story, Americo, Blanca and her husband, Ernesto Pineola, were talkative but mostly busy serving customers stopping by for a meal. Blanca took time out to talk about the future of El Olivo. Two years ago, Paula had a stroke and Americo took time away from the restaurant to take care of the matriarch of the family. Blanca said she suddenly found herself having to be more than a waitress, having to also help with managing the books. “Even at the hospital, my mother was still running the restaurant, at home in bed she was running it, to this day she is running it,” Blanca said. Blanca said her brother, Saul Ibarra, is serving in the United States Army, but she is hoping that when he retires he will rejoin the family business. Paula admitted that her stroke changed the way she sees numbers and that it was emotional watching her daughter step up. She is hoping her daughter, son and grandchildren will take over the restaurant for the next 30 years. Blanca and her husband Ernesto have three children of their own. “They will definitely be my waiters soon — you can count on that,” Blanca said.